Throughout his career, Beethoven was besieged by piano makers, importuning the maestro to use “their” instruments, often without charge; clearly, his imprimatur was worth a great deal. Yet of the many which qualify as “Beethoven pianos”, including Stein (1796), Walter (1801), Jakesch (1802), Bohak and Moser (1803), Streicher (from 1809 onwards), Vogel (1814), Schantz (1815), Kirschbaum (1817) and others, only three were valued highly enough to be retained by the master. Surprisingly, only one of these, the quadrichord Graf of 1825, employs Viennese action; the remaining two, the 1803 Erard and the 1817 Broadwood, use (Italo-) English grand action, the direct descendant of the original Cristofori action of c.1700. It may be significant that Beethoven’s earliest use of the more robust English action, with its heavier touch and louder sound, was around 1802, the year of the famous Heiligenstadt Testament, in which he acknowledged for the first time that the increasing deafness of the previous six years was likely to become total. In 1801 and again in 1803, he took delivery of English action Erard grands from Paris, retaining the latter to the end of his life. The leading English fortepiano maker Thomas Broadwood met Beethoven several times in Vienna in late 1817 and, on returning to London, sent him a six-octave grand inscribed ‘Hoc instrumentum est Thomae Broadwood Londini donum propter ingenium illustrissimi Beethoven’, and signed on the nameboard by Kalkbrenner, Ferari, Knyvett, Cramer and Ries (Beethoven’s friend, pupil and London agent), who had presumably contributed to the costs of building and transmitting the instrument. After travelling by sea to Trieste, the fortepiano travelled two hundred miles overland to Vienna; on arrival, the Vienna Arts Gazette noted that it remained “perfectly in tune,” describing it as “the most perfect Grand Piano Forte perhaps ever constructed – of such excellence that no other in our country can be compared to it,” not, one imagines, what the Viennese makers wanted to hear. After Beethoven’s death, the dealer Spina bought the Broadwood at auction and presented it to Liszt, who kept it in his music room at Weimar. 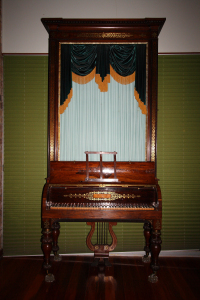 It was bequeathed by Princess Marie Hohenlohe to the National Museum in Budapest, where it now resides, except for a period of some months in 1992 when, following full restoration by David Winston (restorer of the 1821 Stodart and 1841 Pleyel in the Schureck Collection), it was used for concerts in London and Vienna.